“I didn’t even know that 200-year-old burr oak was there,” said Matt Millen, Sauk County landowner. Presence of fire-tolerant oaks with sprawling branches testify to a fire-influenced landscape. Restoring fire-dependent natural communities – Fire is a natural and necessary component of some plant communities such as prairie, oak savanna, and oak woodlands. Periodic fire is beneficial for the regeneration of the trees and wildflowers in these natural communities. Maintaining or improving wildlife habitat – Fire can improve habitat for wildlife through increasing plant production (both quantity of growth and seed production), availability of browse (forcing top-killed shrubs to resprout), and creating the specific habitats needed by unique wildlife. Controlling competition between species – Fire can reduce the encroachment of undesirable shrubs and trees into restored prairies, savannas, and oak woodlands. Fire may only top-kill the shrub or tree and temporarily prevents it from competing with shorter wildflowers. For Matt’s savanna, frequent prescribed fire along with red cedar tree removal once again singled out the old burr oak and breathed sunlight into dozens of species of grasses and flowers almost extinguished by shade. How do I know if my property had prairie or savanna? How do I find a prescribed burn contractor? The Power of Your Voice at a Local Working Group (LWG)Attract the Right Bird, Build the Right House. Flank, Head, and Back Fire: Know the Difference? Erosion: How Much Is Too Much To Sustain Agriculture? 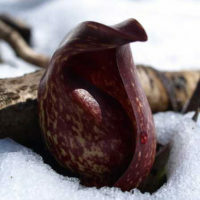 QUIZ: Skunk Cabbage – A Sure Sign Spring Has Sprung?